I am so excited to share today’s post with you, not just because it’s a drool-worthy recipe, but because it’s a guest post from my friend Jess who blogs over at Hello to Fit! Jess is a Virginia Blogger and social media consultant for small businesses. 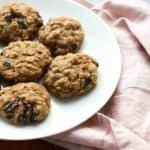 I absolutely love her blog and her approach to a healthy lifestyle so I asked her if she’d be willing to share a recipe with my readers! 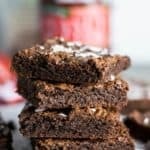 I’m so excited for you to try this brownie recipe! Coconut products have been all the rage lately. Growing up, I remember that coconuts came in three forms: fresh, shredded, and as canned coconut milk. Welcome to 2018, where we can hydrate with coconut water, make a delicious snack with coconut flour, and then bake something sweet with coconut SUGAR. Coconut sugar is an alternative to regular refined sugar. It’s made from the sap of cut flower buds of the coconut palm, and has been utilized in regions around Southeast Asia for thousands of years. When I traveled to Thailand, I got to see local women making coconut sugar at one of the markets! While thinking of a recipe to make for you all, I knew I wanted to incorporate two things: simplicity (in regards to ingredients) and a unique ingredient (i.e. coconut sugar). With our busy lives and growing to-do lists, we can always benefit from making an easy recipe with simple ingredients, right? While coconut sugar is “still” sugar, there can be trace amounts of benefits to cooking with coconut sugar as opposed to table sugar. Coconut sugar ranks 35 on the glycemic index, whereas regular sugar ranks between 60 and 75. A lower glycemic index could mean less chances of blood sugar spiking (less “crash” afterward), which impacts insulin levels. Does that mean you should consume massive amounts of coconut sugar because it’s “healthier” than regular sugar? Not necessarily, but it’s nice to know that we can make small changes without sacrificing taste and flavor. Yes, you read that correctly. There is NO compromise on flavor and taste when it comes to these gluten free brownies! If taste-testing could be arranged over the internet, you’d be able to see, feel, and taste how similar this gluten free brownie is to a regular version. Crackly top? Check. Chewy on the outside, yet soft on the inside? Done. 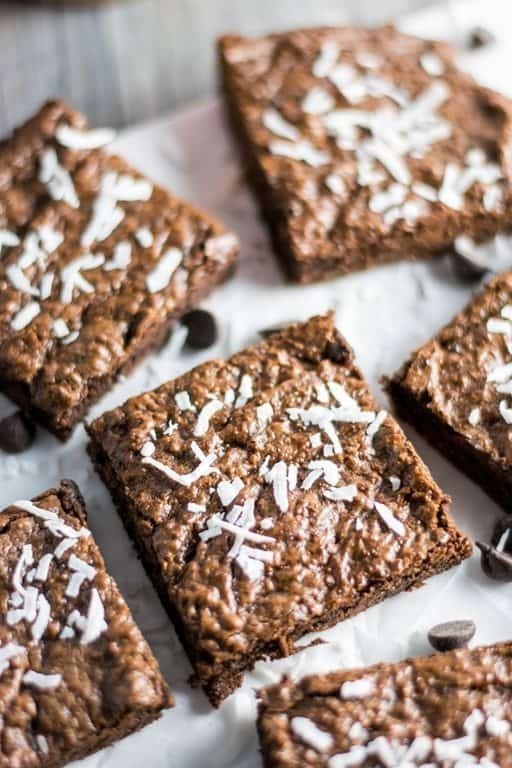 Bites that are packed with chocolate flavor, and just the right amount of shredded coconut? You bet. A dessert recipe that qualifies as “easy and simple” means that one bowl is used, and I can mix it by hand. 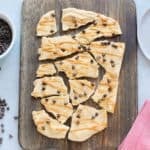 After melting the chocolate chips in the microwave, all it takes is mixing the remaining ingredients together with a rubber spatula, pouring the batter into a square pan, and smelling the magic that unfolds in your oven. It takes a lot of self-control to wait until these brownies cool before slicing, but I did it. Aren’t you proud? For you, the blogging community? Anything. Even waiting to nosh on a couple of these, especially since no one wants to see messy, oops-sliced-them-too-soon pictures of brownies! Preheat oven to 350° F. Line an 8×8-inch square pan with parchment paper. Lightly grease with nonstick spray (I used coconut oil spray). Microwave chocolate chips in a large, microwave-safe bowl for 1 minute. Stir with a rubber spatula, and heat for an additional 30 seconds to 1 minute, until melted. Using a rubber spatula, mix in almond butter, cocoa powder, and coconut sugar until smooth. Stir in vanilla extract, salt and eggs. Combine until smooth. Pour brownie batter into pan and smooth over with spatula, leveling out surface of batter. Bake for 20-25 minutes, or until the brownies are set in the center. Be careful not to over-bake. Remove from heat and cool for approximately 15 minutes before cutting. Brownies can be stored in an airtight container. This post was originally published in April 2018. Updated September 2018. Have you tried coconut sugar? Jess is a social media strategist living in Charlottesville, VA. She’s passionate about helping small business owners use social media to not only establish strong relationships within their communities but build trust and credibility with new and existing customers!. Love the recipe. Oddly enough I’m using leftover coconut brownie scraps that I froze a few weeks ago to make coconut brownie chip ice cream as I write this. What a coincidence! I’ll have to give the coconut sugar a try sometime soon. 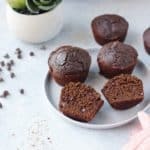 These look delicious, and I love a grain free brownie that doesn’t require almond flour! Peanut butter, chocolate and coconut, what a great combination! I will definitely be making these little gems. Pinned! 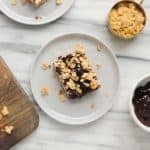 I’m all about coconut flour and coconut sugar so I know I would love these brownies. These look really good. We’ve been cooking a lot with coconut flour lately and I’ll have to add these in to try as well. YAYAYAYA! Looks so yummy, Jess! Jessica these brownies are uber drool worthy!!!! Must make them asap! Gluten free baking has come a long way. I am always looking for tasty treats to make for my friends wen they come over for dinner. These sound wonderful!! 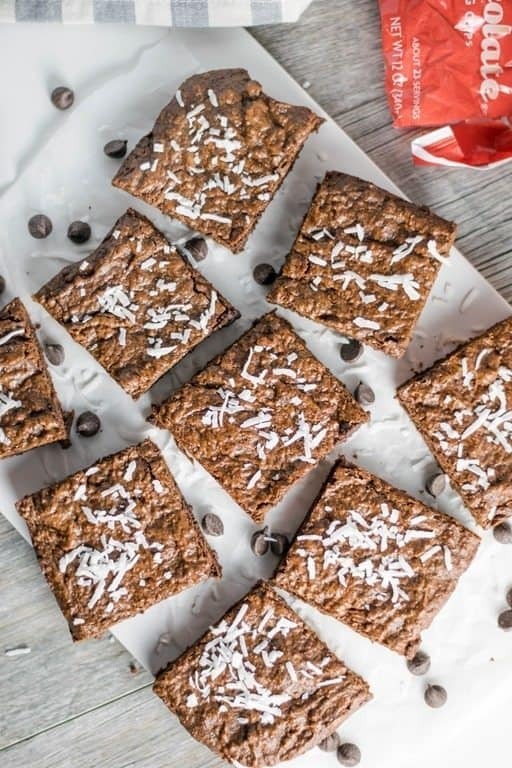 Brownies with a hint of coconut… Yes please! It’s always fun to learn of new ingredients! 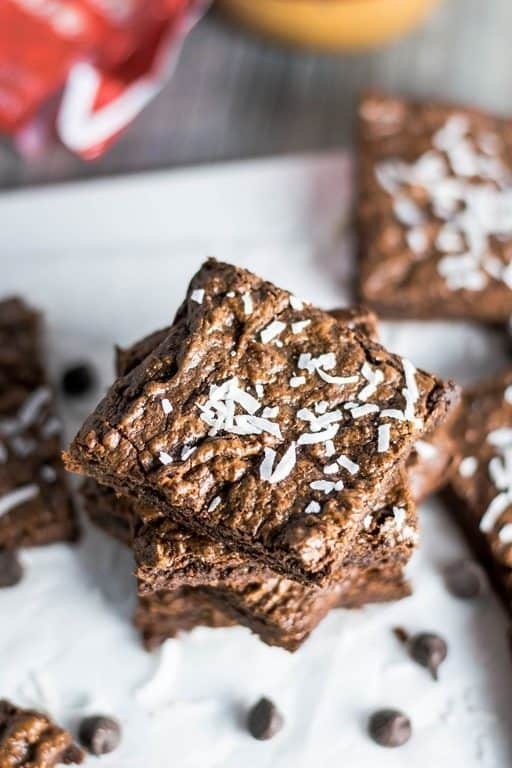 I use many coconut products, but haven’t tried coconut sugar… These coconut brownies look and sound fabulous! I am not sure how, but I have never put coconut in brownies before. These look so good! You’ll have to give these a try! I love chocolate brownies! Looks like I will have to try this recipe, thank you! 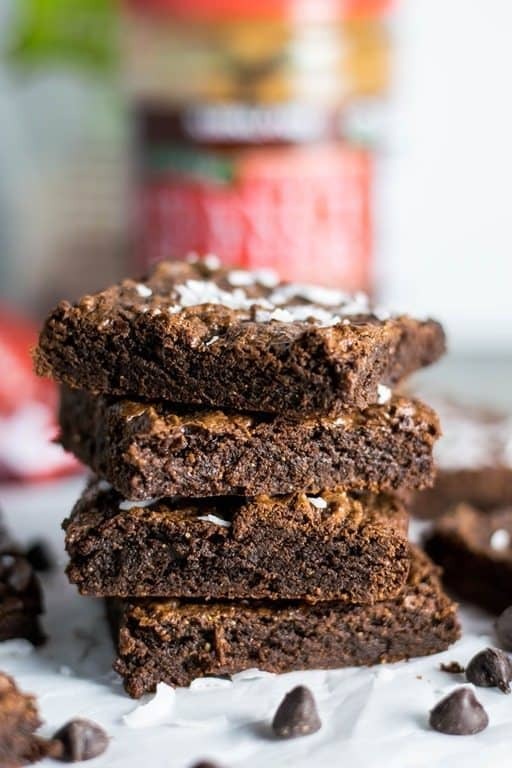 Wow… these brownies look amazing… and love the info about coconut sugar… I’m going on a quest for some this week! These look delicious! I love coconut sugar and how it has a similar taste to brown sugar, which is my favorite! And anything with coconut, I’m all in..